2 Bedrooms, 2 Baths, DIRECT OCEAN & BIRD SANCUTARY VIEW, Sleeps 6, Free WiFi! This is just 1 of 10 different Licensed Key Largo Vacation Rentals that I manager for you to choose from. So if your dates are not available for this unit, go to the HomeAway home page and type in any one of the following listing numbers in the box "Where do you want to go". 130780, 119632, 132539, 354110, 3831245, 4179084, 4328627, 4328849, 4328851. 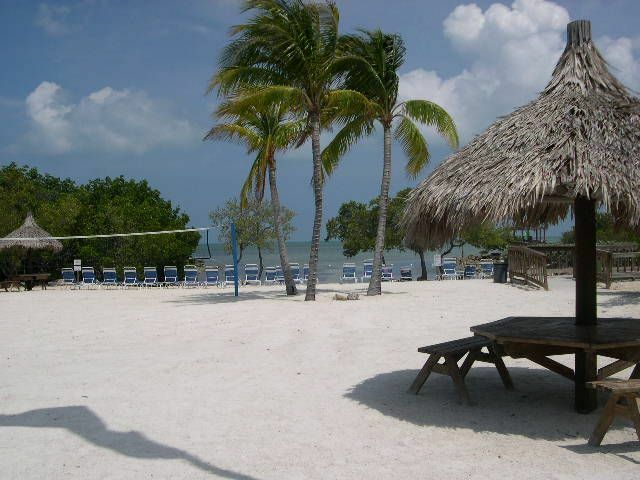 The oceanfront condo is located in Tavernier Key, a community situated along the southern border to Key Largo. The grounds encompass over 60 acres and is situated in a tropical paradise surrounded by mangrove forest, coconut trees and the pristine turquoise waters of the Florida Keys. From dawn to dusk you can enjoy the many activities the resort has to offer or just relax in your oceanfront suite which offers beautiful ocean views. Your vacation begins the moment you drive through our gatehouse entrance into our beautifully landscaped tropical grounds and enter your spacious two bedroom suite. This unit is 'D-Model', the MOST requested of the 4 condo layouts because it is the ONLY one with two separate balconies. One in the living room and the other in the master bedroom, each offering spectacular ocean views and each overlooks a Protected Wildlife Refuge Area. Dozens of species of birds and animals can be seen in their native habitat, such as a family of Osprey, their nest is perched directly behind the unit. Major upgrades to the unit were done in the winter of 2018. The upgrades include, New King Size Bed in Master, New Natuzzi Leather Queen Size Sleeper Sofa bed and Loveseat, New 60" Ultra HDTV in Living Room, New Solid Wood Dining Set, New Carpeting in both bedrooms, and New Window Blinds. The resort has an array of amenities designed for all to enjoy. A typical day can include a round of tennis followed by a swim in our huge Jr. Olympic size pool with separate whirlpool spa. Or maybe you'd prefer to get some sun and play volley ball on our private Ocean Front Beach. You can also rent a kayak and explore the surrounding keys wildlife. Then again you may just want to have a cocktail or snack at our Oceanfront Cafe & Launge, followed by a relaxing stroll along our Private Boardwalk and Marina. These are just some of the activities you and your family can enjoy. Fine restaurants and shopping are just minutes away, along with boating, fishing, snorkeling, diving, and wind surfing facilities. This resort truly offers you everything you could want for the perfect Keys vacation, book your week now before someone else does! During Peak Periods (12/22 - 1/5) or (Feb 15 - April 20) All Reservations are typically based on Sat - Sat stays. I chose to purchase this unit because of its location and because of the spectacular views that it offers. This is a very popular resort that offers modern amenities and a wide array of activities. Great Amenities along with direct Ocean Views make this a very unique vacation rental. Condo: 2 Bedrooms, 2 Full Baths, Central Air, Telephone, (2)Cable TVs, DVD, Stereo/CD, Fully Equipped Kitchen, Microwave, Toaster, Dishwasher, Washer/Dryer, Linens/Towels, (2) Private Balconies with Ocean views and much more. On site: 24 Hour Guarded Community, Jr. Olympic Size Pool, Hot Tub, Tennis Courts, Kids Play Ground, Cafe/Restaurant, Oceanfront beach, Beach Volleyball, Tiki Huts, Bar-B-Q grills, Private Marina with Boat Ramp, Boat Yard, Slip Rentals, Kayak and Paddle board rentals, nature trails and Plenty of R &R.